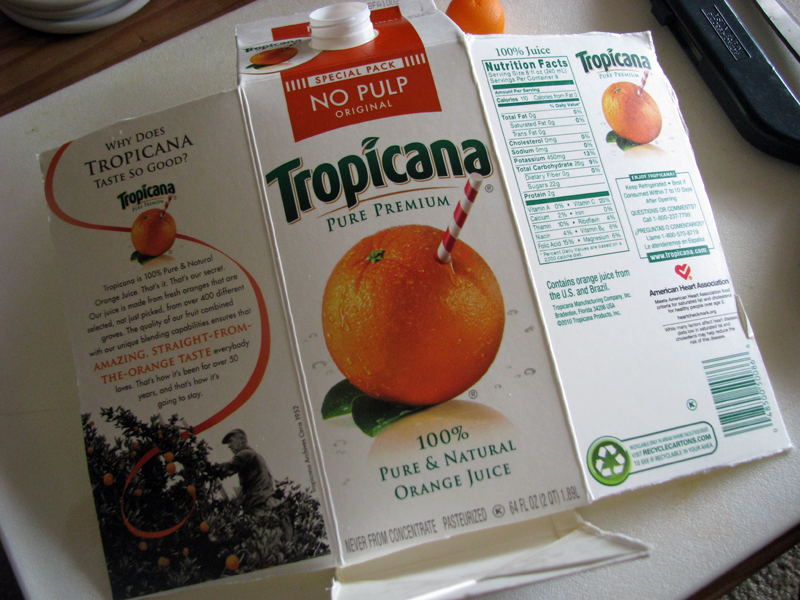 If you have an orange juice carton - or any type of juice carton - in your recycling bin, you can create a cool recycled craft. With scissors, a cutting blade, glue and a few other basic supplies you and your child can easily put together one, or all of, these simple juice carton projects. Choose from a desk organizer, wallet, sailboat, portable dollhouse, or snack container. With back-to-school season, comes homework. So this is the perfect time to get all of those supplies organized. When pencils, crayons, paper clips and more are organized and ready for any homework or school project that come your child’s way, it makes the chore that much easier. This orange juice carton was transformed into a desk organizer using nothing more than a craft knife, hole punch and twine. It is a fun way to display all of your children’s art supplies and it’s completely portable too. In a few short steps you’ll be floating your very own juice carton sailboat on a nearby pond or stream. Our easy sailboat can be adapted to have a long piece of twine attached so you can retrieve it from the water without having to jump in and get wet. 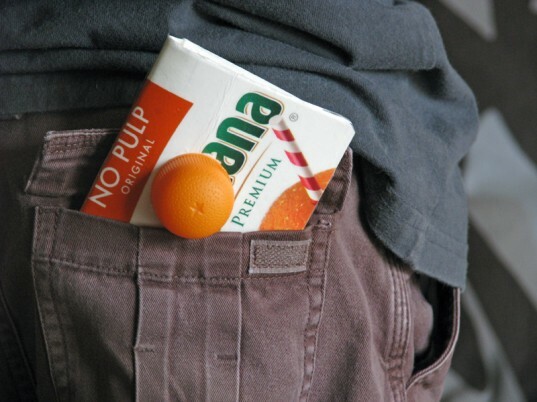 Transforming an orange juice carton into a wallet is another project that is super simple, with only minimal tools required; scissors and a craft knife. In just a few minutes your child will have a fun carrying case to tote their trading cards, dollar bills and coins. Not to mention, it looks pretty cute sticking out of his back pocket. All parents are familiar with the long-lost snack containers that are sent off to school, never to be seen again. Instead of sending your nice, eco-friendly reusable snack containers to school with your child, have them craft a batch of their own. These snack packs are durable, reusable, washable and completely recyclable, so if one does get lost at school – the worst that could happen is that it will be tossed in the recycling bin. Plus, you can make them in an assortment of sizes, perfect for all your child’s snacking needs. What child doesn’t love to pretend play with a dollhouse? 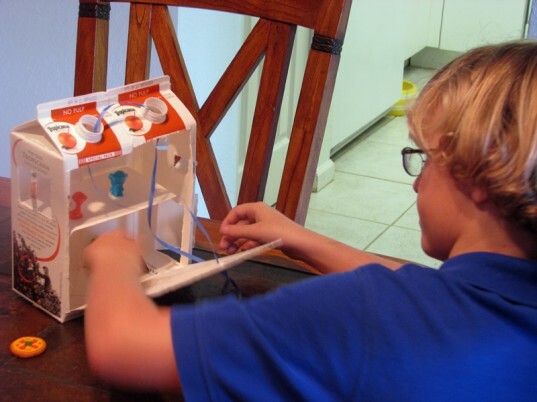 Boys and girls alike can be entertained for hours, playing with small toys that “live” inside of the dollhouse. Not only is our dollhouse made from nothing more than an orange juice container, it’s also completely portable, making it perfect for fun on the go. This dollhouse can be customized to fit any of your child’s small toys whether it is small dolls or Lego mini-figures. 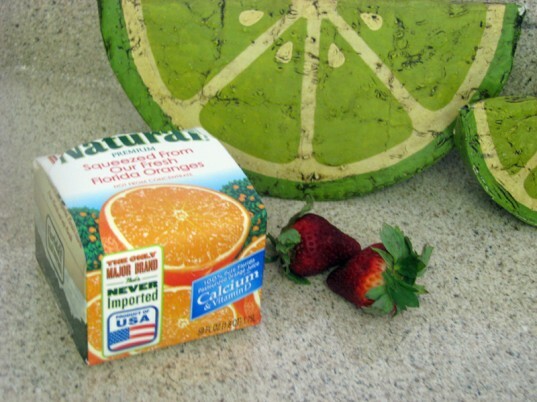 What other creative ways have you recycled an orange juice carton? With back-to-school season, comes homework. So this is the perfect time to get all of those supplies organized. When pencils, crayons, paper clips and more are organized and ready for any homework or school project that come your child's way, it makes the chore that much easier. 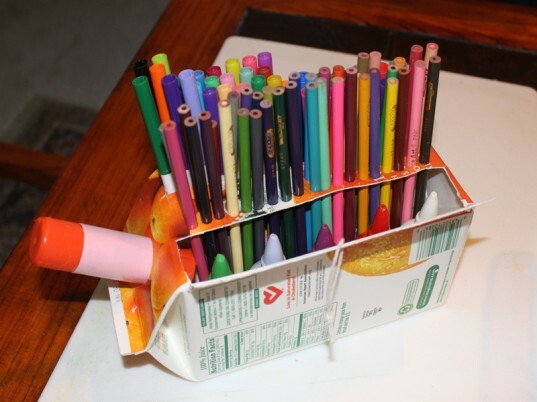 This orange juice carton was transformed into a desk organizer using nothing more than a craft knife, hole punch and twine. It is a fun way to display all of your children's art supplies and it's completely portable too. 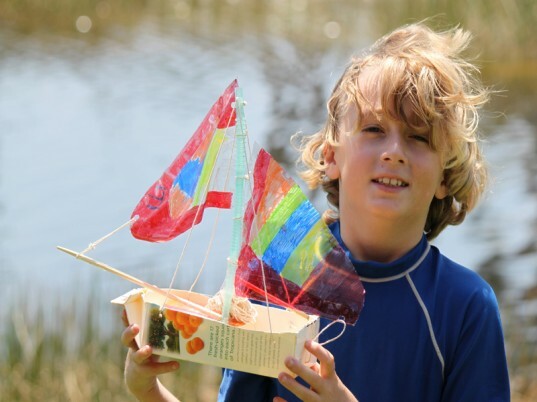 In a few short steps you'll be floating your very own juice carton sailboat on a nearby pond or stream. Our easy sailboat can be adapted to have a long piece of twine attached so you can retrieve it from the water without having to jump in and get wet. All parents are familiar with the long-lost snack containers that are sent off to school, never to be seen again. Instead of sending your nice, eco-friendly reusable snack containers to school with your child, have them craft a batch of their own. These snack packs are durable, reusable, washable and completely recyclable, so if one does get lost at school - the worst that could happen is that it will be tossed in the recycling bin. Plus, you can make them in an assortment of sizes, perfect for all your child's snacking needs. What child doesn't love to pretend play with a dollhouse? Boys and girls alike can be entertained for hours, playing with small toys that "live" inside of the dollhouse. Not only is our dollhouse made from nothing more than an orange juice container, it's also completely portable, making it perfect for fun on the go. This dollhouse can be customized to fit any of your child's small toys whether it is small dolls or Lego mini-figures.